The ferry terminal at Puteri Harbour are in service since 08-May-2013. Currently the services are only extended to Harbour Bay (Batam) and Tanjung Balai (Karimun). As for Harbour Front (Singapore), the ferry service is expected to commence by early of June, 2013. 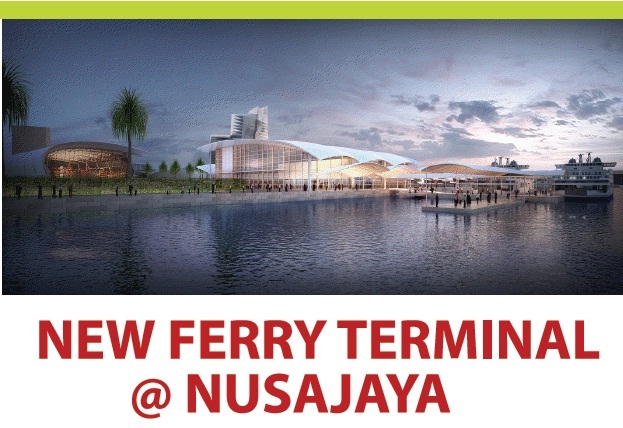 By having these ferry services, it will attract more tourists especially from Indonesia to visit Puteri Harbour / Nusajaya / Iskandar. This will also boost the tourism industry at Johor. Indeed a good news for Iskandar Malaysia. * The above daily ferry schedule is subject to change without prior notice. 1. Ticket counter price at Puteri Harbour International Ferry Terminal, Nusajaya, Johor. 2. Adult (age 13yrs and above), Child (age between 3yrs-12yrs), Infant (age below 3yrs old). Puteri Harbour International Ferry Terminal, Johor. For more info and details. Hye good day, FYA. We are from the management team of Puteri Harbour International Ferry Terminal, Nusajaya, Johor. I would like to inform you that we had changed the schedule and price.FYI, we have receive some complain from our customer about clash time with your website and from our brochure. 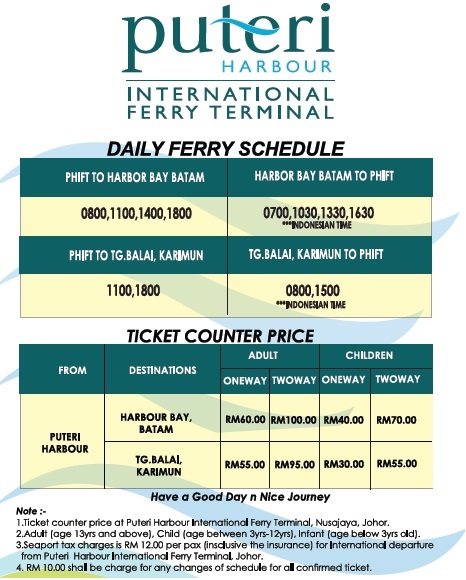 For upcoming update, please follow us on our Facebook (https://www.facebook.com/Puteriharbourferryterminal).I hope from your management will update the schedule. Is there any way to transport goods from Malaysia JB to Indonesia Batam. is there a car park facilities @ ferry terminal ..what is the rate per day ?